Duendes (like gnomes) are part of a lot of latin american folktales but also from all around the world. They are mischievious and hide your stuff usually to play pranks on you, sometime they get attached to a home and make people's life miserable with their jokes if they don't like the new tennants. One common thing among the Duende stories I've heard is their pointy hat and prankster nature. I've heard from them from people from Central America, Spain, US, and Philippines. There's some ways to get rid of them, my grandma says you have to speak rudely to them, and they will give your stuff back. Some people say you can leave sweet stuff for them at night, like condensed milk, and they will eat it and be happy with you. 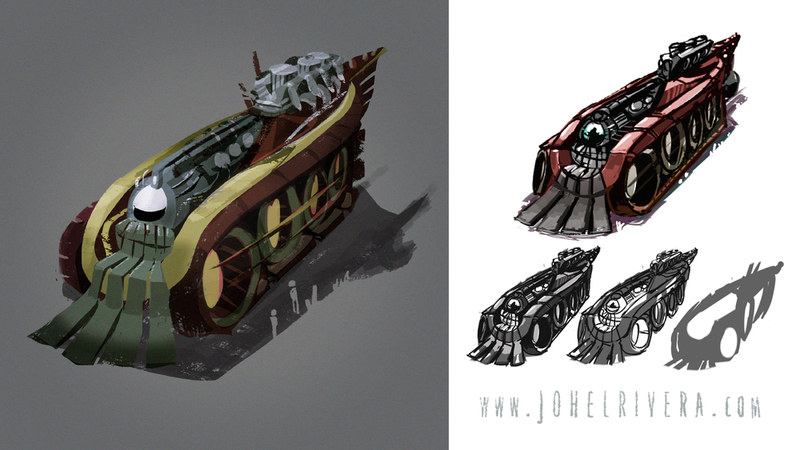 Here's a little bit of the design process behind this vehicle. First, some random shapes, using a combination of a low controlable brush and eraser until something that sparks an idea happens. Then some line-work over the shapes to make visible what the mind sees. Add some tone work to define volumes followed by color exploration. And the peace out and render for a while. Hey! This is something I kept to myself for a while, is an exploratory ending to the Lizards have no Friends story, in the form of comic. It was pretty fun to make, the story, at the time of this writing is a somewhat different, and I'm eager to keep on developing it. But for now I hope you enjoy this! Sometimes I like looking through windows, just sit back and observe. I can't see a lot, because forgetting my glasses is an everyday thing. Sometimes you don't need your eyes to see. A friend asked the important questions, how can he sign checks with flamey hands? Well, Catdog Asbestos Gloves of course.